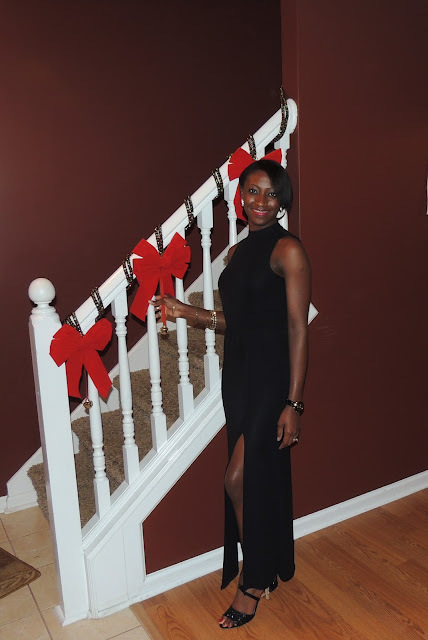 I promised an outfit post of what I wore for the Christmas party and here it is. It's a simple black dress that has been hanging in my closet itching to be worn since I bought it. When I saw this dress, I wasn't really looking for another black dress, but this is one I just couldn't pass up. Especially given the price and store it was from. So I went with my instinct and made the purchase. It almost became my birthday dress, but I opted for another black dress for that occasion. In short I was not expecting to find a dress this simple, classy and elegant at Forever21. It shows skin in all the right place but not too much or on the border line. I love the back of the dress which is not pictured. It's open back and I'm usually cautious of those type of dresses. This open back is done in a way that it gives a bit more coverage rather than total exposure. Bottom line, this is a great dress at a great price from found at an unexpected store. I'll be loving this dress for a long time. In less than 12 hours and it will be 2013. Let's make the rest of 2012 count people. You look beautiful. The dress fits you well! you look great! loving your shoes. just recently discovered your blog, loving your outfits..now following you on GFC! Glad you're enjoying your time here.